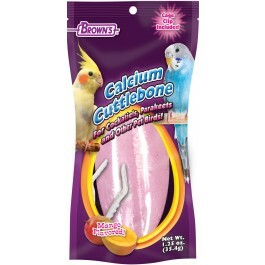 Brown’s® Mango Flavored Calcium Cuttlebone is a superior calcium supplement source for all pet birds. Insert the Calcium Cuttlebone into the open end of the clip and squeeze. Gently push the opposite end of the clip between the cage bars until the clip and cuttlebone are secure. Calcium Cuttlebone should be offered continually and replaced as often as needed. Calcium Cabonate, Ground Cuttlebone, Oyster Shell, Grit, Fish Oil, Vitamin B1 Supplement, Honey, Artificial Mango Flavor, Colors Added (Blue 1, Red 3).